As American as baseball and apple pie, center console boats can be found from coast to coast, on lakes, seas and rivers. How well do you know them? 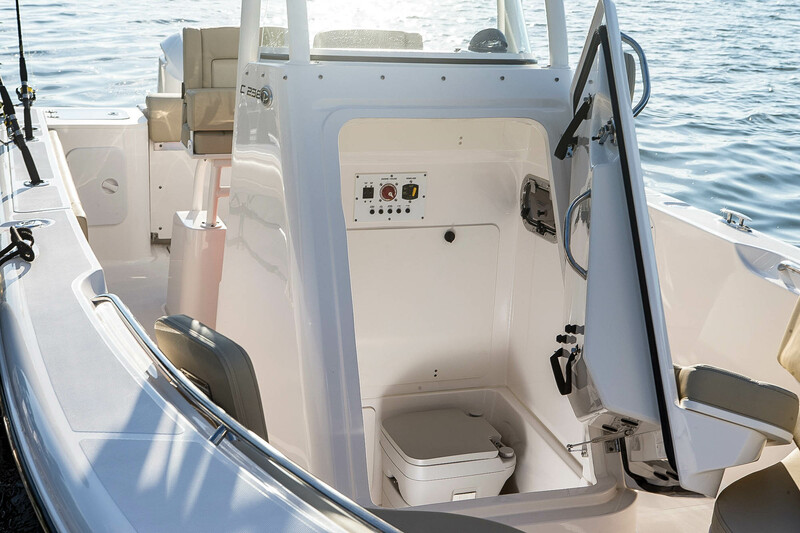 The center console fills a void in boating. 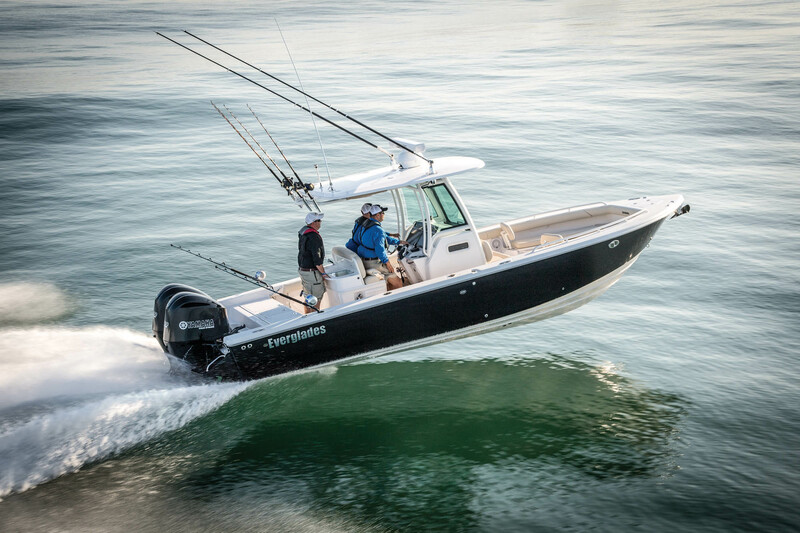 Typically larger and safer than an inflatable but smaller than a beefy sportfisher, they appeal both functionally and economically to a broad class of boat buyer. By virtue of their design and build, they can be multitaskers — from a mean fishing platform to a family coastal cruiser. Read on for a look at their evolution, purpose and practicality, especially in the sub-30-foot range. Evolutionarily, the center console design certainly resembles the deckboats of yore. People who worked the seas, whether fishing, seining or clamming, typically had a small deckboat or a skiff with low gunwales, to make it easier to haul in their catch, and a simple console in the middle that made the rest of the boat workable. No fancy helms, electronics or the like. In the bays near where I grew up, clammers dotted the horizon with their flats boats and tall rakes, and the crew mounted an umbrella to stave off the blazing sun. Speed was critical to get their catch back to market, so the boat bottoms were relatively flat. Additionally, they were used as simple modes of transportation and as work boats, pushing and pulling other vessels around yards. Who invented the modern CC is up for debate. Credit can be given to Boston Whaler, which crafted 13-foot and 16-foot CCs in the very early 1960s, complete with a mahogany wood console and the signature blue interior (on some of them, anyway). By interior, I mean the backside of the glass hull. AquaSport Boats took the spotlight with the launch of the “modern day” center console to the recreational market in 1967. It may be a case of semantics when it comes to who was first and how, but those early days of CC history have yielded a plethora of builders today, packing their CCs with features and comforts found on larger boats. 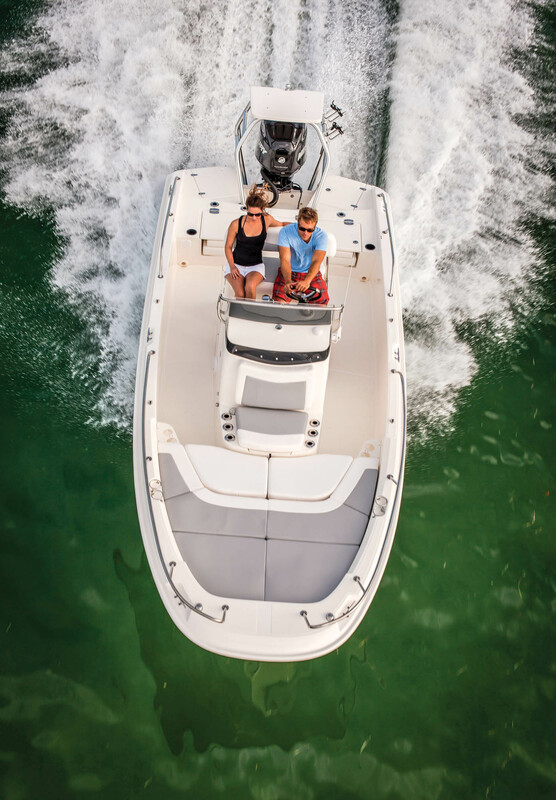 Boston Whaler 210 Dauntless – Go with the Activity Tower on the Boston Whaler 210 Dauntless. It serves as a poling platform, ski pylon and wakeboard rack. 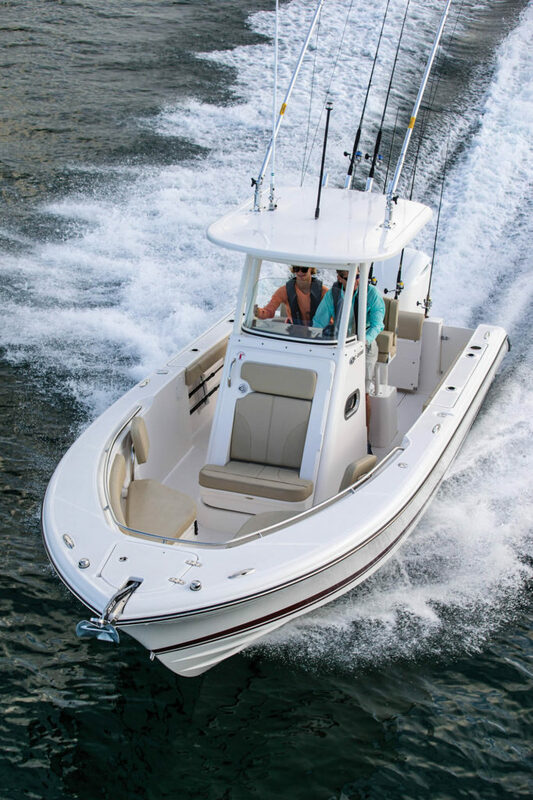 Cobia 296 CC – Offering an 82-square-foot cockpit, the Cobia 296 CC also handles twin outboards up to 600 hp. All deck hardware is recessed to prevent line snags and for a clean look. Center consoles were, and still are, used primarily for fishing. The open, walk-around layout makes it easier to tend lines and fight a fish. Jockeying the boat to stay with the line, like anglers have to do on a sportfisher with a cockpit, is minimized and even eliminated, as the angler has full 360-degree access (take care around the outboards). That also means more room for swinging a net or a gaff. But don’t think a CC can’t be rigged like the big sportfishers. Builders offer fishing packages of sorts, which can include gunwale rod holders, live baitwells, tackle drawers, in-deck fishboxes, rocket launchers, fighting chairs and more fishing goodies. 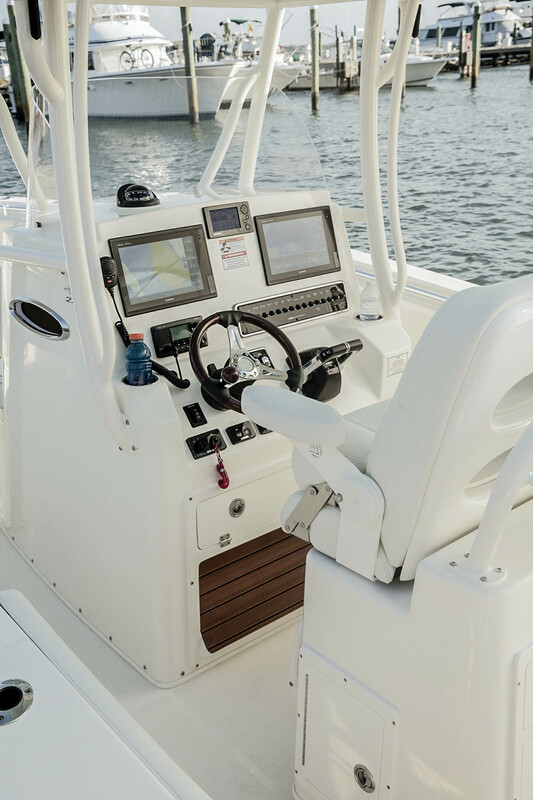 Today, the term “center console” is often interchanged with “walk-around.” Some folks reason they are different because a CC has a one-level deck, whereby a walk-around has a deck or decks that passengers must step up or down to. For now, let’s propose that a CC is exactly that: a vessel with the console in the middle, regardless of decks. And I say that because builders themselves are morphing the definitions a bit. Why? Namely, it’s about offering the most in a product and getting it out the door. Anglers have a need for speed, and CCs can deliver. A visual check reveals that most CCs’ hulls have modified to deep-V deadrise configurations for wave-slicing ability, high performance and stability at speed. Longitudinal strakes help provide lift while knocking down spray. Chines — the area where the hull bottom meets the side — are another feature that abate the spray and help with stability. (So you know, chine walking is the side-to-side oscillation of the hull, a potentially dangerous situation. Google it.) Deadrise decreases aft toward the stern, providing a relatively flatter surface, which allows the boat to ride on top of the water and adds stability when drifting. A CC with a sharp entry and beefy deadrise aft will certainly go fast but will also rock pretty well when drifting, so choose your pleasure. Everglades 275 CC – There are twin forward console seats in front of the three-sided helm with a fiberglass hardtop and a sliding windshield. Powering a CC is pretty straightforward: outboards. 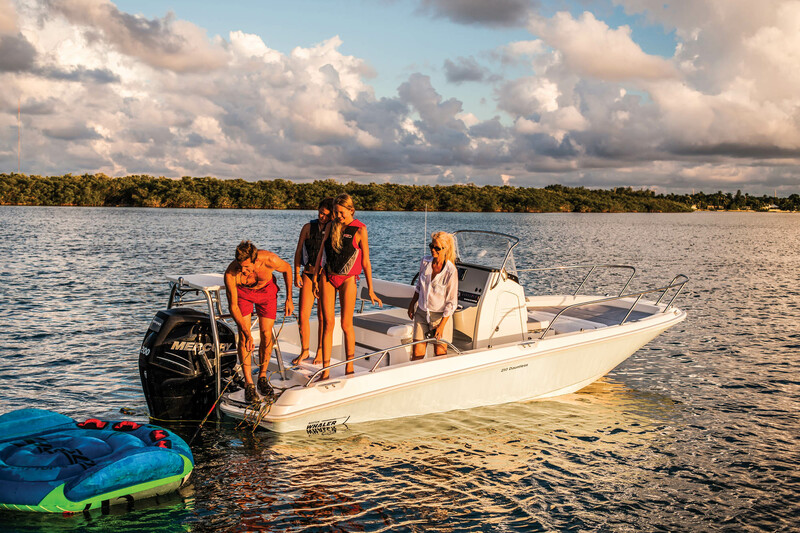 From single to multiple — yes, three, four or even five on larger models — two-stroke to the preferred four-stroke, and bracketed to bolt-on, the outboard engine is the powerplant of choice. (Four-strokes are becoming the go-to engine, as they are more reliable and more efficient). Sure, one may find a CC with an inboard or a sterndrive, but those engines steal deck space and require an engine box that gets in the way. 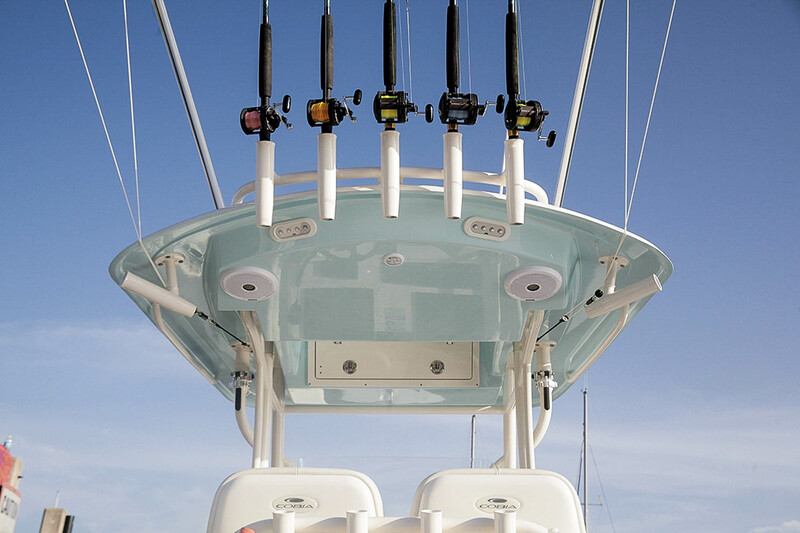 Outboards maximize interior room, have higher speed ranges and decrease overall draft. There are purists who love their inboards, and that’s OK. But skinny water is in sometimes. 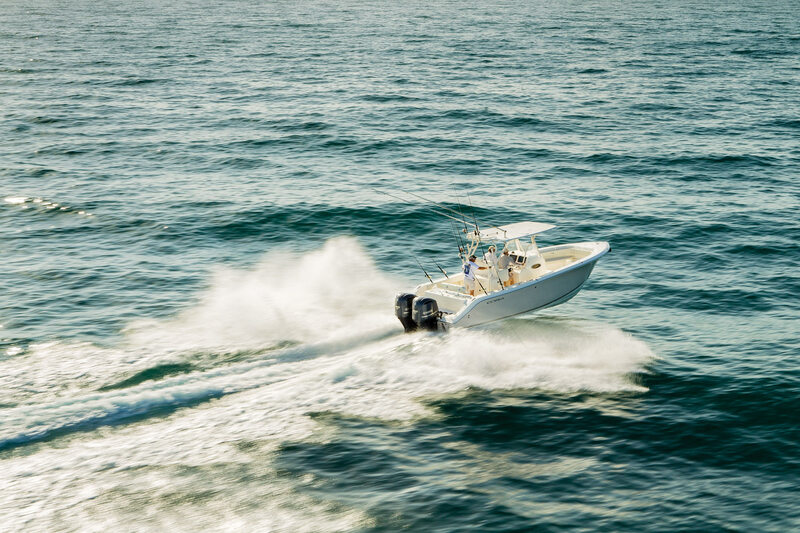 With the right hull/power package, CCs are regularly seen running offshore to remote fishing grounds or out islands, or on lengthy cruises. I’ve seen them 50 miles offshore during fishing tournaments. It’s not all fun and games out there with the fishing team. Sometimes, the family wants in on the action, and builders have noticed. First, the helm does not always have to be in the open, exposed to the elements. Many builders offer a three-sided fiberglass enclosure around the helm, as an add-on or an integral component. Some owners opt for a T-top or a hardtop with tubular framing, or a half-tower. Some up their features game with dual helm seating, a forward helm seat and preferred electronics. Convertible seating options can be found all around, from removable filler bow cushions and loungers to flip up/down cockpit seating. Don’t forget the helm seats with reversible backrests for aft-facing seating, bolsters and leaning posts. Also morphing for the better over the years has been the safety factor. Gunwales are sufficiently high to keep all passengers, even those engaged in a fish fight, inside the vessel. Grabrails and railings are fitted to make them easier to hold on to. And some CCs offer retractable bow anchors, to keep swimmers away from the engine props. Surprisingly, some CCs have helm consoles that are large enough to contain an enclosed compartment below, perfect for a changing room and even a portable toilet. With the right power package, CCs are great for skiing or tubing. Or just sit back and take a leisurely cruise. Either way, manufacturers are making the CC market more family oriented and user friendly. Pursuit C238 CC – A great feature on the entry-level Pursuit C238 CC is the walk-in helm console with a head. The fiberglass hardtop is a bonus, too. 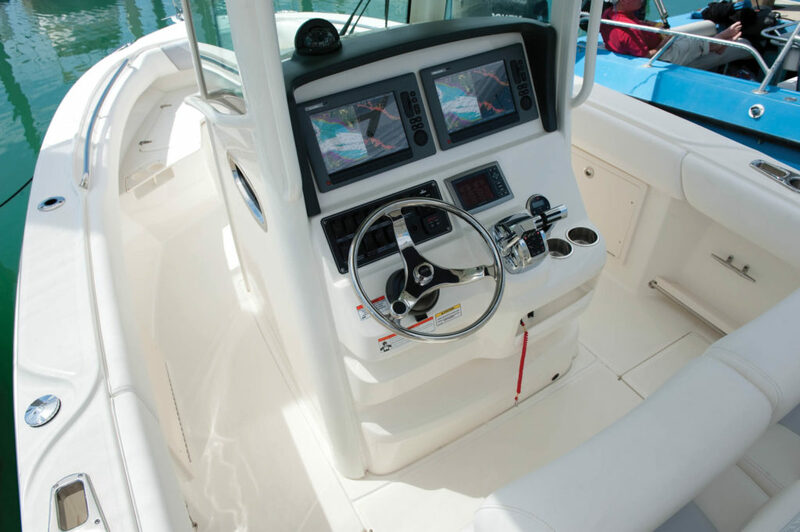 Many center-console manufacturers’ websites offer the option to build a boat, right online. Buyers can research which one suits their boating desires and then choose colors, packages, engine options and much more. The right one may just fill a void in your boating life.